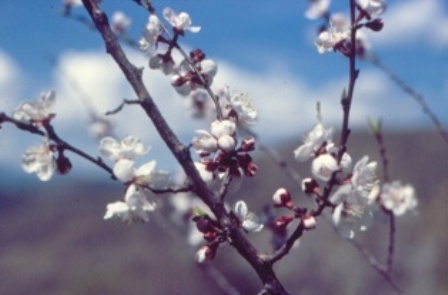 Zardalu a commonly growing wild apricot in North West Himalayas.. This tree is common in hills ranging from 1,100 to 1,700 metres above the mean sea-level. Most of the plants are seedlings baring fruits varying flesh and kernel characters. A deciduous, large and spreading tree with dark-brown to black bark; height, around 10 metres, may go up to 15 metres in some cases; girth, 82 cm; wood, hard and durable. Leaves, broad, cordate, dark green, petiolate (petiole, 24 cm long), alternate, having reticulate pinnate venation; length, 6.2 cm; breadth, 6.1 cm; margin, serrate. Flowers, simple, sessile, pentamerous, perigynous, actinomorphic, complete, hermaphrodite, light pink; 2 to 5 flowers per cluster; calyx, gamosepalous, companulate, with five sepals, light red, having 3-to-5mm-long lobes of sepals; corolla, polypetalous with 5 petals, rosaceous, valvate, actinomorphic, angular, imbricate, 1.5 to 2.0 cm long, white to light pink; androecium, polyandrous, with 35 stamens, dorsifixed; anther-lobes, yellow, episepalous, bithecus; gynoecium, monocarpellary, perigynous; ovary, unilocular, having basal placentation. Fruit, a drupe, velvety when young, but nearly smooth at maturity, round to oblong; diameter, 2.5 to 2.6 cm; weight, 12.6 g; volume, 11.20 ml; fruit, externally yellow; pulp, deep yellow, less juicy than that of the cultivated apricots; endocarp, flat, smooth, stony and hard. Stone, 1.7 to 2 cm long, 1.6 to 1.7 cm broad, 2.5 g in weight, 1.3 ml in volume; 2 kernels, per seed; kernels, 1.5 cm long, 1.2 cm broad; weight, 879 mg; volume, 757 microlitres. 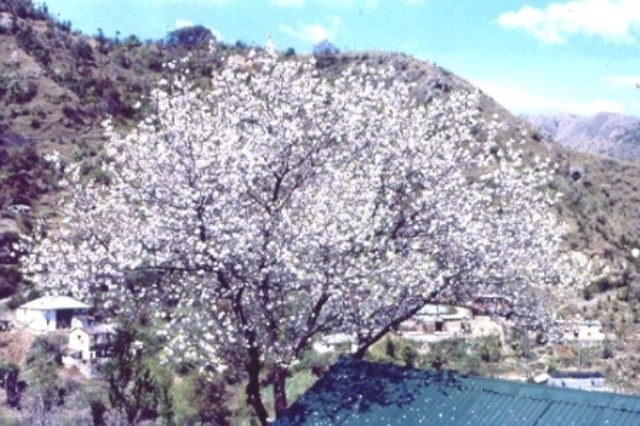 The flowering season was observed to continue from the first week to the last week of March under Sanwara conditions. The fruits start ripening from the middle of May and continue till the first week of June. The average yield was recorded to be 47.5 kg per tree. The fruits are pulpy and the pulp is 81 per cent of the whole fruit, having 58.5 per cent moisture. The total soluble solids content of the fruit pulp is 17.2 per cent. The acidity is 1.34 per cent and the content of total sugars is 6.30 per cent. The reducing and non-reducing sugars are 6.25 and 0.041 per cent respectively. The pectin content is 2.52 per cent. The vitamin C is 9.95 mg per 100 g of pulp. The total mineral content of the pulp, as represented by its ash, is 2.452 per cent. The percentage content of different mineral elements in the pulp is phosphorus, 0.083; potassium, 0.996; calcium, 0.042; magnesium, 0.033; and iron, 0.010. The protein is only 0.67 per cent. The fruits are antidiarrhoeal, antipyretic, emetic, allaying thirst and not good for old people. The seeds are tonic and anthelmintic, used in liver troubles, piles, earache and deafness. In Tibet, the masticated wild apricots are applied in ophthalmia. In Afghanistan, the fruits are considered to be laxative and refrigerant in fever. Fruits are sweet. They are more acidic than the cultivated types. They also lack the flavour which is present in cultivated types. The overall quality of the fruit is fair to good. The fresh fruits are generally eaten. These fruits are more acidic than those of the cultivated types. Excellent chutney is made from the wild apricot fruits. These fruits can also be used for making jam. Chopped kernels are added to kheer in villages. The fruits of wild apricot are also sun-dried to make chalori, which is used as a souring agent in many food preparations. A chaat is also made from chalori after soaking it in water and mixing it with spices. 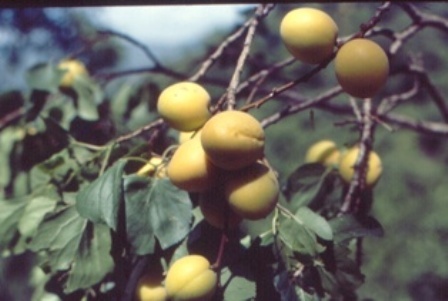 The seedlings of this tree are used as rootstock for the commercial cultivars of apricot. The wood is hard and durable and is used for making agricultural implements, thatching mud houses and is used as fuel.